Not every laser user has the capability to analyze a lasers performance. 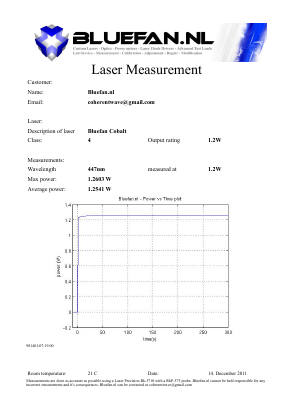 Bluefan.nl offers an independent measurement of a lasers' specifications. This includes a power vs time measurement and determining it's wavelength. The independent performance verification of a laser can also be used to help customers and sellers as a 3rd party. If requested the measurement can be repeated with the addition of an IR filter or visible light filter. This is useful to determine the unwanted IR leakage in DPSS lasers. The costs of a measurement starts at 10 euro per laser excluding shipping both ways. Please request a quote for additional measurement options such as determining IR leakage, laser adjustment or beam diameter/divergence measurements.